It has been a while, but I have decided to bring Favorite Things Friday back to life! Each week I will share my faves from beauty, fashion, cooking, decorating, DIY , shopping and more! I hope everyone has had a wonderful week. It has been a week of new beginnings in our home. Ashlyn started her junior year in high school and my oldest, Woods, started his Freshman year of college. We are so proud of them both. Woods will be attending college on an academic and golf scholarship. Move in day was yesterday so it felt really strange this morning with him away. Enough about me….let's get started! I'm sure you'll love these faves as much as me, but please visit the site directly for pinning. I adore homemade signs and this one is perfect! You can find the tutorial over at A House of Handmade. We have loads of tomatoes in the garden along with basil. This looks so yummy. Looking forward to trying this bruschetta from Saving Everyday for Disney. I love a great makeover and this one is spectacular. You really should check out the before. The old set that most would giveaway now looks like a high end set! Visit Seeking Lavendar Lane for the details. I am always amazed by the clothing refashions that I come across on Pinterest. I wish I could do something like this. It is hard to believe that frumpy yellow dress is now this stunner. Even if you can't sew the project, how about dying an old faded piece for a new look! You can find all the details at Life is Beautiful. My Repurposed Life has really transformed this old sewing table into a fun beauty! What Meegan Makes is sharing tips on bringing your collections together to create a striking statement piece! 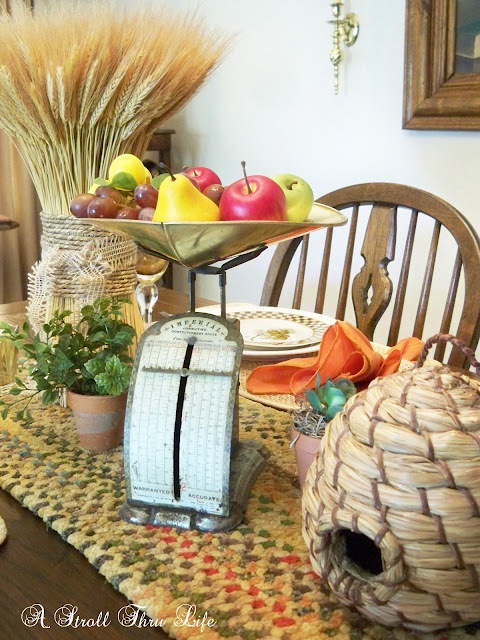 Think outside the box when you create your next tablescape. I love the collected early fall look from A Stroll Thru Life. Mark your calendars! I am participating in this early fall tour next month. Be sure to visit for ideas to inspire your fall home! Great picks of favorites. Love the homemade signs too! Great! Mich recently posted…This Home Looks Tiny From The Outside, But Wait Until You See The Inside! Thank you so much for sharing my statement piece. I really appreciate it! All of your choices are stunning. Thank you so much for sharing my Patio table, this for sure made my day! All amazing inspirational ideas for the start of the weekend – bring it on!!! What city is the home tour located?